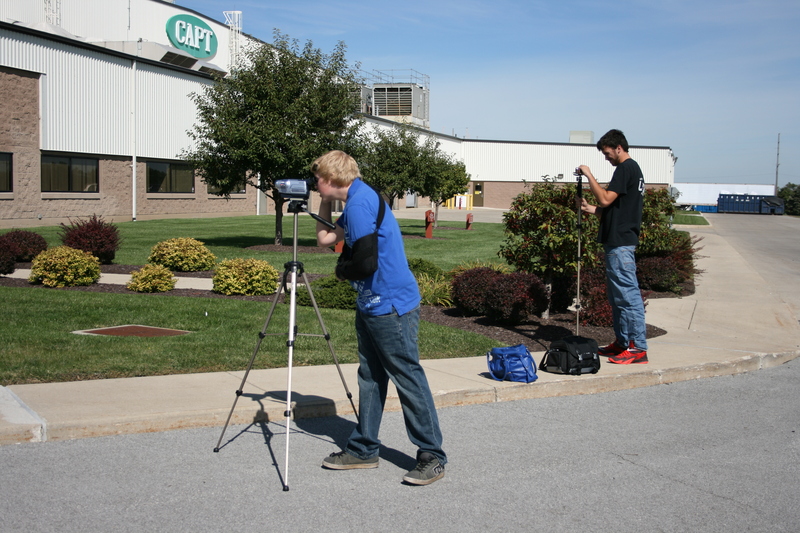 The Interactive Media class had the opportunity to make a video for CAPT this week. CAPT’s “mother company” Honda Foundry has been in business for 50 years. There will be a huge celebration in Japan at the end of October. Delegates from CAPT will travel to Japan to take part in the celebration. The video that the Interactive Media class created will be shown as part of the event. Today Susan Leo from International Business College spoke to Tri Star juniors and seniors in the Business Management, Graphics Communications, and Interactive Media classes. In addition to information about the programs offered at IBC, she also discussed the importance of pursuing scholarships and helpful interview tips. The students learned that 25% of a job interview is based on your ability to communicate. She shared that employers ask “What is your number one weakness” to measure how you can identify and improve a weakness in their company. She left the students with a reminder to always write a handwritten thank-you note following an interview. Friday, September 19 is the registration deadline for the October 25, 2014 ACT. Seniors, if you haven’t taken your ACT yet, this is the time of year to do it. You may need your scores for scholarship applications! Did your know that ACT publishes a “Question of the Day“? They also have some practice ACT questions and test tips on their Test Prep page. Katie Mustain and Bruce Patton stopped in at Tri Star today to talk to the Business Management, Interactive Media and Graphic Communications classes about the many programs and activities the University of Northwest Ohio has to offer. Students were surprised to learn that the campus is much bigger than they thought. They also learned that the student population comes from near and far at UNOH. 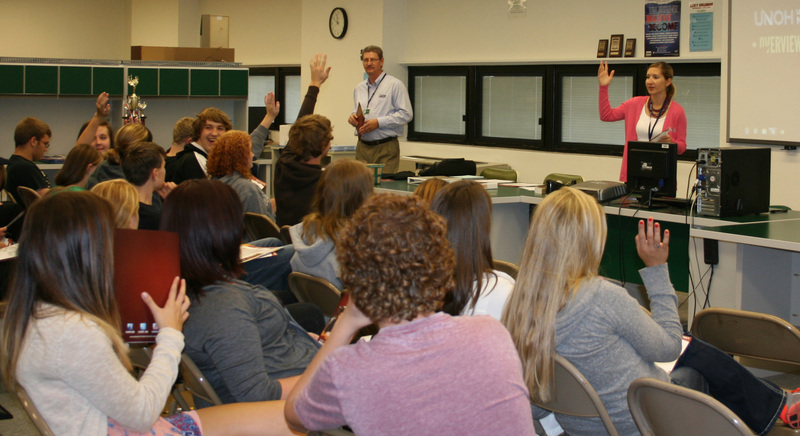 Katie and Bruce told the students about the many fields of study, financial aid opportunities and scholarships offered. UNOH is having an open house on Friday, October 24, 2014 from 9:00 a.m. – 3:00 p.m. for seniors. Seniors can take a scholarship test while they are at the open house. There are 25 scholarships available for the day. The top scholarship prize is full paid tuition. A few years ago a Tri Star BPA student won this scholarship! The same opportunity will be available to juniors in April 2015. The following links and the worksheet needed for the assignment will be posted on thirdfloorbpa.wordpress.com, as well as being accessible on Moodle. To access Moodle, simple go to moodle.celinaschools.org > Tri Star > Business Management Juniors or Seniors. You do not need a user name and password – simply log on as guest. Read the links, and do the worksheet to learn how to calculate break even points. Break even analysis will show us why it can be more profitable for manufacturers to produce items in large amounts. Fixed costs (F): Costs that do not vary with the number of units produced. These costs might include rent, salaries, building costs, machinery costs, etc. All BPA members are invited to compete for prize money using a visual online business simulation. This competition is FREE to all registered BPA members. BPA members will take over a struggling computer repair business. They will discover old time sheets documenting employee hours and old invoices for repair services rendered. They will use this information to cut unprofitable service offerings and reprice other offerings to maximize profitability of this service business. This challenge is based on a pre-release version of the Virtual Business – Accounting curriculum from Knowledge Matters, Inc. Students’ general business, management, and accounting knowledge will be be tested. The prizes are $1000, $500, $250 for 1st through 3rd place respectively. BPA members will compete via the Internet individually or in teams of up to 3. Members may sign up for the challenge beginning January 20, 2014. The Internet-based challenge will run from February 3, 2014 through February 21, 2014. Registration begins Monday, January 20, 2014.